Whether the temporary folder is accessible or not through the public html, it's best to keep the temporary folder empty. 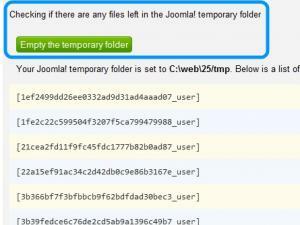 The temporary folder is used by Joomla! when installing extensions. Some do not install properly, and files are left there. RSFirewall! 's System Check feature verifies if the folder contains any files and offers the possibility to delete these files directly from within the component. File and Folder Access Check - Checking if there are any files left in the Joomla! temporary folder.